Wow, what a crazy few days here in Oklahoma. The freezing rain that has taken down many trees and power lines in the metro area and left so many without electricity has really wrecked some serious havoc. 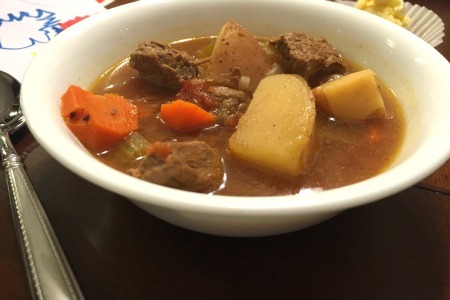 I can’t think of a better meal for these cold days than beef stew. It’s so filling, comforting, and when you make it fresh (not from a can) it can really pack layers of great flavor. I was able to adapt the Beef Stew recipe from Autumn Calabrese’s 21 Day Fix Cookbook, Fixate, to create the following slow cooker recipe. With busy family schedules, I turn many recipes into slow cooker friendly recipes. There is nothing better than a balanced, 21 Day Fix approved meal ready in your slow cooker once you get home from work. Add onion and celery; cook stirring occasionally, for 5 to 6 minutes, or until onion is translucent. Add garlic; cook stirring frequently, for 1 minute. Add 1 cup broth and wine; cook, stirring constantly scraping bottom of pan so beef doesn’t stick, for 5 to 8 minutes, or until liquid is reduced in half. Place contents of saucepan into slow cooker. Top with salt, pepper, bay leaves, carrots, tomatoes, sweet potatoes, and remaining broth.